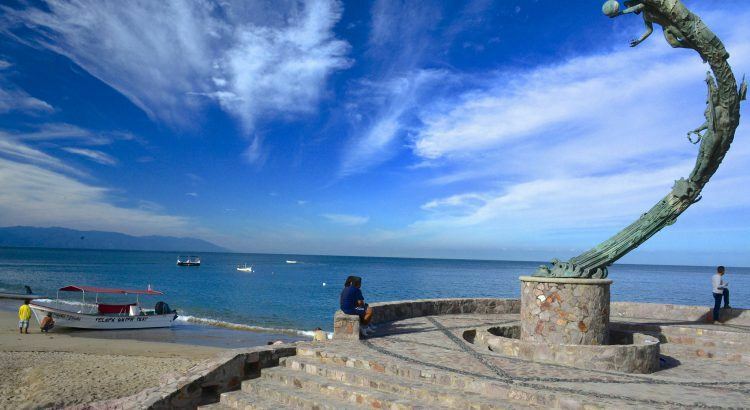 The picturesque Mexican seaside town of Puerto Vallarta just 30 minutes from Villa La Estancia in Nuevo Vallarta is a location brimming with art galleries, public sculptures and street art. Each of the numerous art galleries in Puerto Vallarta has a very distinct line of work, displaying art from artists that come from all parts of the world. You will find a wide variety of sculptures, ceramic artwork and paintings in these galleries at reasonable prices for you to decorate your vacation home or choose as gifts for special occasions. The downtown area of Puerto Vallarta comes alive each Wednesday evening when the seasonal ArtWalk is up and running from October through May. Locals and visitors alike can enjoy the weekly activity which involves many of the top Puerto Vallarta galleries opening up in the evening throughout the Centro Historico area, offering a glass of wine and a chance to meet local artists. The ArtWalk provides a great opportunity for mingling and sharing one’s appreciation of art. The first to open in Puerto Vallarta, this art gallery carries a host of artwork created in various styles and mediums. You can expect to find abstract sculptures and modern paintings among a host of colorful exhibits. The chic look of this gallery is the perfect setting for the ultra-contemporary exhibits held here. This gallery specializes in sculptures, paintings and photographs, and is one of the most professional galleries in Puerto Vallarta. Your can expect the most unique indigenous artwork to be found in this Mexican art gallery that pays homage to the crafts and artwork carried out by local indigenous artists. Here you will find stunning beaded artwork, yarn “paintings”, statues, Oaxacan wood carvings and traditional artworks crafted in tin. Short for Office for Cultural Products (or Oficina de Proyectos Culturales), the OPC gallery functions as a nonprofit organization geared towards promoting the unique talent of Puerto Vallarta’s very own contemporary artists and providing a platform for discussions about art and educational programs. This colorful art gallery contains remarkable work done by Mexican artisans: furniture, fashion items, jewelry, home accessories and novelty gifts. There is so much to see when it comes to the various art styles and mediums found in Puerto Vallarta’s art galleries. There is always something to catch your eye.